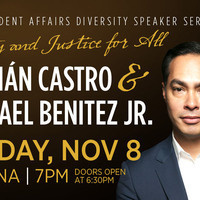 Join us for the Division of Student Affairs Diversity Speaker series featuring Julián Castro and Dr. Michael Benitez, Jr. on Thursday, November 8th, at 7pm in SECU Arena. This event is FREE and open to the public. Doors open at 6:30pm. Speakers’ remarks will be followed by a moderated Q&A with Dr. Alison McCartney, Department of Political Science faculty. There will also be an opportunity for an audience Q&A. For questions or accommodations, please contact (410) 704-2051 or diversityworks@towson.edu. Even before he burst onto the national scene in 2012 as the Democratic Party’s first Hispanic keynote convention speaker, Julián Castro was already the embodiment of the American dream. The grandson of an orphaned immigrant from Mexico, Julian and his twin brother (current U.S. Rep. Joaquin Castro) often accompanied their mother, Rosie, as she worked on behalf of their community as a political activist. In 2001, at age 26, Castro became the youngest elected city councilman in San Antonio history at the time. In 2009, he was elected Mayor of San Antonio (the youngest mayor of a top-50 American city). As Mayor, Castro became known as a national leader in urban revitalization and for expanding educational opportunities for the city’s low-income students. Appointed the 16th Secretary of HUD by President Barack Obama in 2014, Castro launched many new initiatives that help people achieve a better quality of life. He recently released his new book, An Unlikely Journey: Waking Up from My American Dream. Michael Benitez, Ph.D., is a nationally-acclaimed activist-scholar, practitioner, and educator, with extensive experience in diversity issues in higher education. He is known for his down-to-earth, insightful commentary and critical perspectives on social and cultural issues including social justice education, equity and inclusion, diversity and multiculturalism, intercultural development, identity formation, race and ethnic relations, knowledge representation and production, youth and leadership development, student success, and critical pedagogy and praxis. His work on creating campus community participatory frameworks for difficult conversations and institutional action is forthcoming in New Directions in Institutional Research. Part of Dr. Benitez’s success lies in his ability to speak heart-to-heart while bridging theory and scholarly inquiry with everyday life, his use of accessible language that multiple audiences can relate to, while providing multi-context and -issue frameworks for empowerment and transformation. Currently, he serves as the Dean of Diversity and Inclusion/Chief Diversity Officer, as well as Title IX Officer, at the University of Puget Sound, providing leadership over the coordination, implementation, and assessment of operational and strategic goals related to diversity strategic planning and institutional efforts to foster and sustain an equitable and inclusive campus climate.